Besides gently removing the top layer of the skin and leaving it smooth, dermaplaning is amazing at erasing the fuzzy hairs all over the face. The skin will glow, feel smooth, and is quite obvious during the application of foundation over the skin. 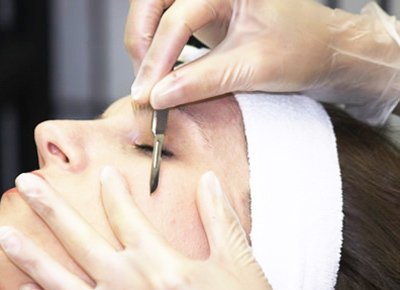 Dermaplaning is a non-invasive procedure performed by a licensed dermatologist or plastic surgeon and quite safe. It offers the patients another option and is very effective in leaving the skin smooth and youthful looking. It may sound scary when I mention “sharp blade” but no need to worry; the procedure is painless and quite safe on most skin types. The dermaplaning technique is a manual exfoliation of the dead skin and temporarily removes the fuzzy hairs (vellus hair). A qualified and experienced dermatologist can easily perform this technique without any trauma or injury to the skin using a dermaplaning blade at a 45 degree angle while scraping the surface of the skin. How often should someone have it done? Your dermatologist may recommend having this procedure done once every 4 to 6 weeks, and you do get better results if you get it done on a routine, scheduled basis. This procedure offers better results than the traditional microdermabrasion and helps exfoliate the skin with minimal discomfort, redness and possibly temporary puffiness. It can also be combined with a chemical peel and other non-invasive cosmetic procedures for excellent results. Your plastic surgeon or dermatologist will recommend the treatments best for your skin type. Are there any side effects to derma planing? While they might not be considered side effects, there are some concerns to be aware of especially if you have extremely sensitive skin or frequent acne breakouts. Each skin type is different, and everyone reacts differently to treatments, personally I love this procedure and it has done wonders for my skin. I generally have my skin derma planed 4 times a year, and it has led to amazing results for me. Learn more about various non-invasive cosmetic procedures, and find a local plastic surgeon or dermatologist to consult with regarding your skin type and treatment. Leave a comment below, if you’ve tried this or any other procedure, we’d love to hear what your favorite skin care treatment is.